Use the cooking liquor from the ham to cook lentils, adding rooster potatoes to soak up some salt. 1. Place the ham in a large heavy-based saucepan. Add the orange, onion, carrot, bay leaf and enough cold water to cover the ham completely. Bring to the boil, then reduce the heat and allow to simmer for about 3 hours 20 minutes to 4 hours 10 minutes for a 5kg ham, or 20 to 25 minutes per 500g. 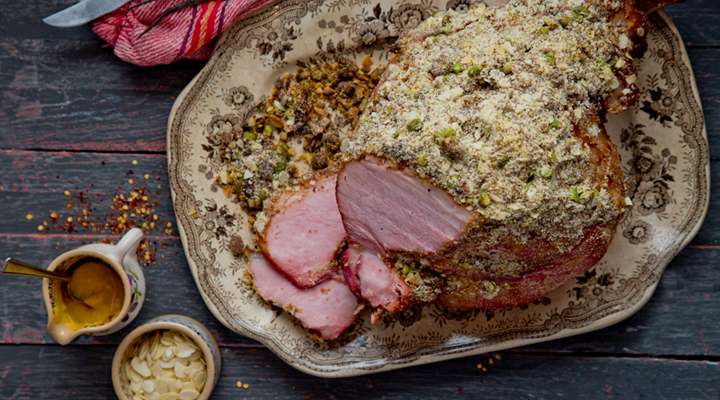 Remove the saucepan from the heat and allow the ham to cool in the cooking liquor. 2. Meanwhile, place the ground almonds, crushed pistachios, crushed whole almonds, Demerara sugar and the orange zest and juice in a small bowl and stir to combine. 4. Remove the ham from the cooking liquor. Using a sharp knife, remove the rind, leaving an even layer of fat. Place the ham on a baking tray and score the fat in a criss-cross diamond pattern if desired. Spread the mustard over the fat, then using your hand or a spatula, press the nut mixture onto the mustard. Roast in the oven for 30 minutes, until the crust is caramelised. 5. Remove from the oven and rest for 30 minutes, loosely covered in a foil tent, before slicing.